This article will discuss free scratchcards in the UK with information about why companies and websites run these promotions and why they are given away in magazines and outlines the advantages and disadvantages of playing them. There are some examples at our other website www.borntoloaf.co.uk which has a prize given away each day. Okay so you have found, been awarded or received a free scratchcard either online or in a magazine. You have probably just joined the majority of people who could not resist getting a coin, or in the case of a computer one using the mouse of the PC, and rubbed off the covering to reveal....Congratulations you have won!!! Instant win game, free scratch cards, - there are so many names for these scratch and win cards. The common theme are to have anything from 3, 6 or 9 golden or silver panels in which the player takes a coin, or uses their mouse in the case of a virtual or online one, and rubs the panel to reveal symbols. Most are colourful and some have themes ranging from pirates, cowboys, space, World Cup, The Olympics, Christmas - anything seasonal or news topical. You have to reveal a set amount of matching panels or get a series of matching symbols. Surprisingly, most of them reveal winning tickets and sometimes have the player shouting Bingo Wahay Yahoo Wooooaaa! But hang on a minute - take some time to think about this. You have been given these for nothing. You may not instantly recognise the company or website name. You have entered for the first time and have won a big prize? Glad you asked! We at findextrawork have spotted several catches to free best scratchcards and have described them below. Judge for yourself if playing is harmless fun, a great chance to win prizes or a bit of a scam. It can certainly lead to you playing more and more games and parting with cash. 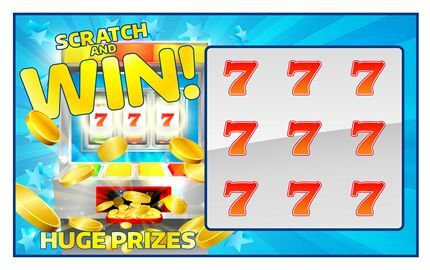 Some websites will give you the opportunity to play free online scratch cards which give you instant notification if you are a winner or loser. We have yet to rub off the panels to find ourselves a loser! So after finishing dancing around the room dreaming of vast money prizes, sports cars or holiday prizes come back down to earth and have another short think - to claim your prize you need to first reveal your name and e-mail address at the very least. Other websites are more intrusive and ask for your address, telephone number, occupation, marital status, salary range, age, date of birth, number of children - rather a lot of information you are giving away. Just what is the company going to do with it? Did you give a password you use on other sites? Is it the same password you use for your online bank account? Did you have to give your bank account details to the website? Are they going to spam you with junk e-mails, phone calls, mailings? Will they sell your details - some rather personal and of interest to a number of third parties? And what about the prize? Well done your efforts to play and win have given you some winning jackpot prize points that can be "spent" on their website. Great news - what do you get to spend it on? Well more prize competitions along with revealing more about yourself. During all this you will have had to visit the website of a gaming company and may be tempted to part with some cash to play some scratch off games, bingo, casino, poker, slot, card or other instant win games. You may have the chance for cash prizes and most websites are reputable and do pay out but you may have started a career as an internet gambler and could lose money you may not be able to afford. Our advice is not to be tempted by these so called offers and get yourself some paying employment using the ideas on the left and right of Find Extra Work. If you really do want to play scratchcard games do see it as a bit of fun, not a get rich quick scheme, and set yourself limits to how long you will play and how much money you will gamble. Set a daily, weekly or monthly limit or budget and stick with it. Great stuff you have revealed a winning one. Now how do you claim for your scratch ticket? In the case of an internet one you simply go to their website and give away your details. In the case of those given away in magazines you will probably have to dial a telephone number to find out what your prize is. In many cases you will be about to dial a premium rate number to claim a prize which is kept hidden until the end of the telephone call - if you ever get there. The phone call will usually be a pre-recorded message congratulating you in a cheery uplifting voice of your good fortune. You may hear some statistics about others and their prizes. The nice voice may also tell you about the company or how to get another winning ticket or other competitions, usually other premium rate phone call competitions. All the while your telephone bill is being charged by the second or the minute for a premium rate number. Some so called ticket winners rarely get to the end of the message to find out how to claim: they get so fed up hearing the blurb of the advertiser with false promises of being able to get minted or a cashcade of cash that they hang up. Others twig and realise that they may have been conned. The sad outcome is a huge phone bill to pay off. Put them straight into the bin or shredder - unfortunately you cannot recycle these bits of card or paper because of the chemicals used on the pads or panels. If you really do like doing them and like the occasional healthy flutter then buy one from the National Lottery or Health Lottery at your local shop, take it home and enjoy your flutter - you could win a prize and some of your money has gone to a worthwhile cause. This advice is generic and reflects upon no known website, company or organisation. There are many reputable suppliers who charge you to play them, users enjoy playing these games and get real prizes. A fine example is the UK National Lottery whose products are available to those aged over 18 years and are available to play at most newsagents, shops, garages, supermarkets, etc. Real people win these real prizes and a percentage of the profits go to worthwhile British charities. There are some websites that are quite fun and safe to play at and some games start at only a penny. Visit the Find Extra Work free scratch card online page for these sites.